When updating retro properties, there's one thing to remember: fans love throwbacks. From the two halves of Skeletor's sword to Cobra Commander's metal faceplate, nods to a series' history are almost always well-received. The Transformers are doing their part to honor the fans whose nostalgia is currently making the line one of the hottest things on the shelves and on the air. While there are some subtle references to the past - there's a green and purple construction unit named Scavenger - some go beyond simple reuse of names. Everyone remembers Starscream, the power hungry, back-stabbing Decepticon lieutenant who transformed into an F-15. And a lot of folks remember the two other planes who shared his design (albeit with different paintschemes), though they may not remember their names. Dubbed "the Seekers" by TransFans, Starscream, Thundercracker and Skywarp were brothers in arms, if not in personalities. click to embiggen For the current Armada line, Starscream finally returned to the Decepticon ranks. Yes, his colors were a bit different, and his jet form didn't really resemble an actual vehicle any longer, but the personality was the same. 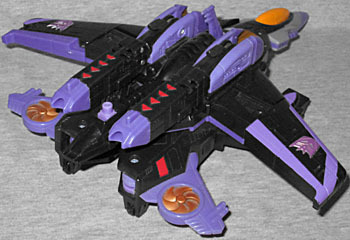 That wasn't enough for Hasbro, though: as a nod to old fans, Starscream was redeco'd to make both Thundercracker (blue and red) and Skywarp (black and purple). 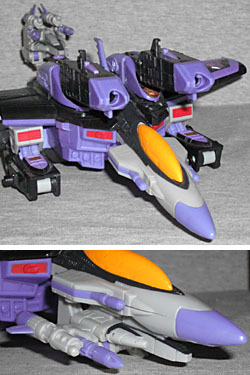 In jet form, Skywarp looks like a fairly average anime-styled airplane - all weird shapes and unclear propulsion. It's very sleek, but doesn't look at all like something that could actually fly. I suppose the horizontal turbines on the rear wings are intended to give the jet a sense of VTOL capabilities, but they really just look out of place. The planes' transformation to robot form seem to borrow a lot from the Valyries in Macross - legs fold out of the back, arms are under the wings, and the nosecone becomes the chest. This is fairly reminiscent of the G1 Seekers' transformation, as well, though now we no longer need to worry about losing pieces that are inexplicably separate. 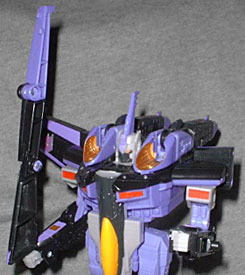 In robot mode, Skywarp is about 7" tall, and moves at the shoulders, elbows, hips and knees. One of his wings folds out to become a sword, but this leaves him looking unfortunately lop-sided. There's a large, unwieldy section of plane that sticks out of his back - anything that could have been done to hide this would have been a vast improvement, even if it was only a hinge to fold it flat against his body (though that may have interfered with his action feature). In both modes, Skywarp makes sounds. Press his cockpit for laser blasts, or the Minicon port on the tail for afterburners. Yes, the Mini-Con. All the Armada Transformers come with their own personal... sidekick... thing. 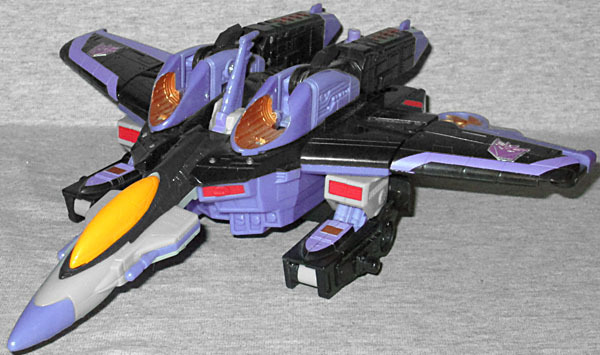 Skywarp's Mini-Con at least makes a modicum of sense, being a smaller airplane. A very angular vehicle, little Thunderclash has a 2" wing span and looks more realistic than his owner. 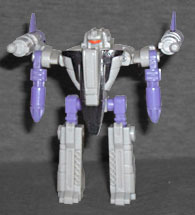 He's molded in gray, with purple highlights that match Skywarp's colors. He changes to a robot quite eaily, of course, though his change is a bit more complicated than most of the other Mini-Cons I have so far - don't worry, he's still excedingly simplistic and in no way presents a dilemma to the folks commited to hating the Minicons. In robot form, he stands about 2" tall, but will have to suffer through life with a complete lack of hands. Still, he's better than the Formula-1 racer that came with the other two jets. Attach Thunderclash to Skywarp, and the larger bot's sounds change: snap him under the cockpit, and the lasers sound more like rockets; plug him onto the plane's tail and not only do the jet thrusters flip forward, but we hear them firing as well. So what sets Skywarp apart from his two Seeker brothers? Why, other than the superior paint scheme, should you choose him? 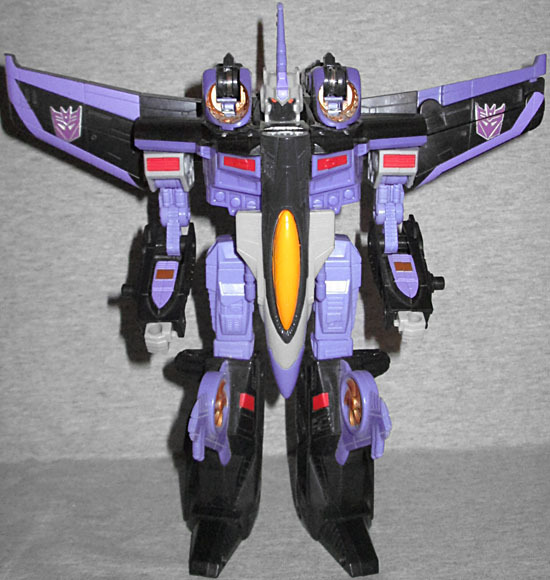 Well, while Starscream and Thundercracker could very well be twins, Skywarp received a slight re-tooling, as well. The VTOL props on his legs are new, as is the fin on his head. He's got a new faceplate, and an extra set of guns on the nosecone. These changes are slight - he still needs to fit in, after all - but they give him some personality. On the old cartoon, Skywarp was pretty much a non-entity. He could always be counted on to stand around in crowd scenes, but he never had much to say and he didn't drive the plot. He was the first Transformer active on earth, and had the ability to teleport short distances, but otherwise might as well have been cannon fodder. He's finally become a distinct member of his trio, and is a great throwback for G1 fans.